Vedat Diriker, started to work at the first discount retail chain store BİM in 1995 as store staff and became a founding member of the Operation Committee (OC). At the end of 2005 he left BİM was Member of the Operation Committee. Then He joined the drugstore operator For You as a Member of the OC until the end of 2008. Then He was consultant to various local discount chain. After He has been worked as director of retail investments at Hayat Holding Company and He has made the establisment of İran’s first discount chain (CANBO) and served as CEO until end of 2013. 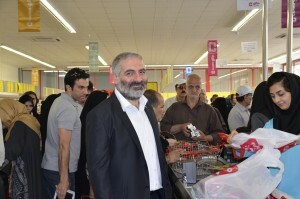 He continues to work as a consultant to the discount store chain in Iran. He was spent 20 years of experience as a member of the executive board in charge of the operation in major companies of retail sector.